My latest update and post where I detailed my plans for this week was published a day early. I structured my week to be sure I had everything in place to 1.) Have enough time to prepare my first batch of protein balls during therapy 2.) Have all the ingredients on hand and to 3.) Maximize my output! I’m still working to get over this cold I have. Sure, consider this post more Therapeutic Writing than anything else. I am holding my head high this morning remembering and acknowledging that I put my wellness first and decided to rest Monday and Tuesday night. I will be meeting up with my personal trainer at 5 this evening. I will be working through 3 hours of Cognitive Rehabilitation Therapy tomorrow morning and I will be climbing some 30 ft. rock walls Thursday evening. By my calculations, that’s 5-6 hours of training within a 36 hour span. Sticking to my usual Saturday morning schedule, that should amount to 7-8 hours of mind, body and soul work for the week. We still had to run out for some honey! Hitting Shoulders and Chest tonight is my plan. I am working to get even bigger than I am now. Seeing myself in the mirror brushing my teeth this morning I have to admit I’m not at all ashamed in my aesthetics/ look. Sure, I’m not on the same playing field as some in many peoples’ eyes, but I feel I’m on the right track to set personal bests time and time again. Body image is not an excuse for any irrational output. 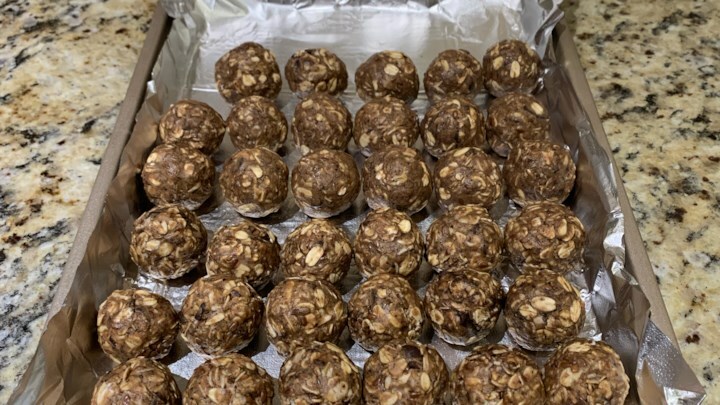 See the latest addition to my Meal Prep for Muscle Growth series on Instagram added to the newer Homemade Protein Ball page (under the More Than Able tab on my site) and let me know what you think. I am looking forward to seeing how far I can take that initiative. Go ahead and bookmark www.KyleKeech.com/KPB !! Not that I’m THINKING TOO BIG or anything, but having multiple plastic baggies with 2-3 protein balls in each set up on a stand under a sign reading $5 each on it, DOES NOT sound outside the realm of possibility to me! SIDE NOTE: Thinking ahead, I can really see myself preparing and/ or cooking a Shepherd’s Pie Meal next week!